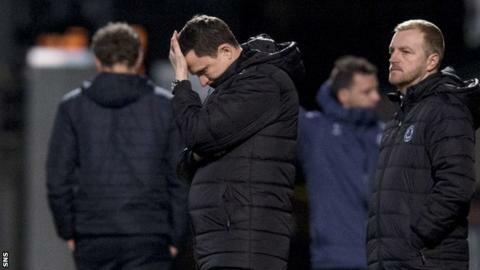 Gary Caldwell has admitted that his Partick Thistle side have not been good enough in the Scottish Championships this season. However, the Firhill boss says he knows what they have to do to turn things around. Thistle are ninth, with just one point separating them and bottom-placed Falkirk. “We don’t want to draw a line under it, we want to learn from it and grow from it,” Caldwell told BBC Scotland. Thistle kick off 2019 with an away trip to Tannadice on Saturday, where they face a Dundee United side currently third in the Championship – a position many Jags fans would have expected their own team to inhabit at this point in the campaign. “Dundee United away will be a difficult game. But, one which we believe, if we’re at our best we can go on and win,” said Caldwell, 36. “It is a new year and I think we’ve highlighted that amongst ourselves this week. In terms of what’s gone on, we learn from that. Part of Thistle’s new year resolution has been an influx of new players to the club since the January transfer window opened. In just four days Caldwell has added no less than five players to his roster, with Joe Cardle and Alistair Roy joining Gary Harkins, Steven Saunders and Conor Hazard at the club. And Caldwell expects more arrivals in the west end of Glasgow before the end of the month. “I’m delighted that the club has managed to get four over the line and we’re still working hard to try and get a few more as well,” said the Thistle coach. “It was something – pretty much from day one since I came in to the club – that we were looking towards January and earmarking the positions that we thought we needed.